In this article, I will set out clear principles for how SAS Viya 3.3 will interoperate with Kerberos. My aim is to present some overview concepts for how we can use Kerberos authentication with SAS Viya 3.3. We will look at both SAS Viya 3.3 clients and SAS 9.4M5 clents. In future blog posts, we’ll examine some of these use cases in more detail. With SAS Viya 3.3 clients we have different use cases for how we can use Kerberos with the environment. In the first case, we use Kerberos delegation throughout the environment. The diagram below illustrates the use case where Kerberos delegation is used into, within, and out from the environment. In this diagram, we show the end-user relying on Kerberos or Integrated Windows Authentication to log onto the SAS Logon Manager as part of their access to the visual interfaces. SAS Logon Manager is provided with a Kerberos keytab and HTTP principal to enable the Kerberos connection. In addition, the HTTP principal is flagged as “trusted for delegation” so that the credentials sent by the client include the delegated or forwardable Ticket-Granting Ticket (TGT). The configuration of SAS Logon Manager with SAS Viya 3.3 includes a new option to store this delegated credential. The delegated credential is stored in the credentials microservice, and secured so that only the end-user to which the credential belongs can access it. When the end-user accesses SAS CAS from the visual interfaces the initial authentication takes place with the standard internal OAuth token. However, since the end-user stored a delegated credential when accessing the SAS Logon Manager an additional Origin attribute is set on the token of “Kerberos.” The internal OAuth token also contains the groups the end-user is a member of within the Claims. Since we want this end-user to run the SAS CAS session as themselves they must have been added to a custom group with the ID=CASHostAccountRequired. When the SAS CAS Controller receives the OAuth token with the additional Kerberos Origin, it requests the visual interface to make a second Kerberized connection. So, the visual interface retrieves the delegated credential from the credentials microservice and uses this to request a Service Ticket to connect to SAS CAS. SAS CAS has been provided with a Kerberos keytab and a sascas principal to enable the Kerberos connection. Since the sascas principal is flagged as “trusted for delegation,” the credentials sent by the visual interfaces include a delegated or forwardable Ticket-Granting Ticket (TGT). SAS CAS validates the Service Ticket, which in turn authenticates the end-user. The SAS CAS Controller then launches the session as the end-user and constructs a Kerberos ticket cache containing the delegated TGT. 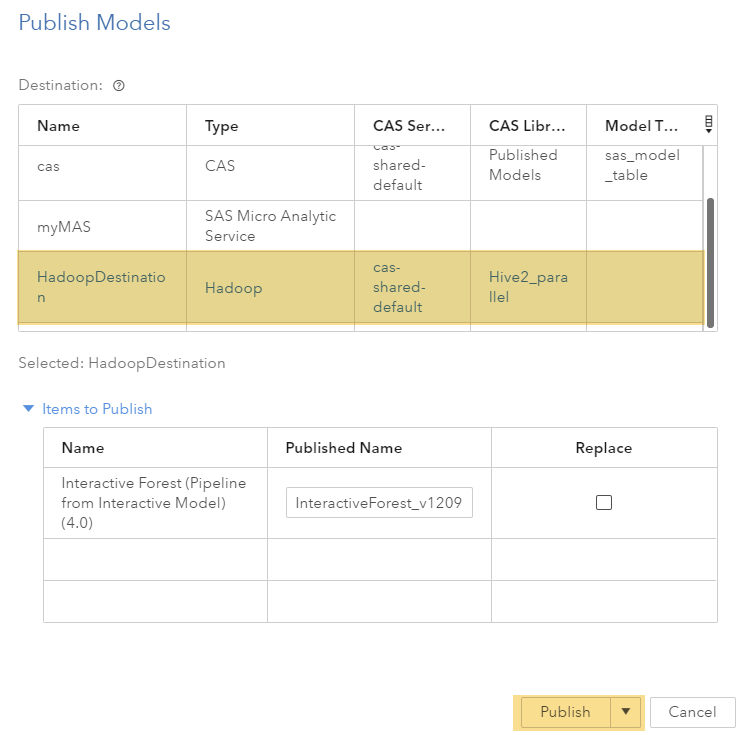 Now, within their SAS CAS session the end-user can connect to the Secured Hadoop environment as themselves since the SAS CAS session has access to a TGT for the end-user. This means in this first use case all access to, within, and out from the SAS Viya 3.3 environment leverages strong Kerberos authentication. This is our “gold-standard” for authenticating the end-user to each part of the environment. But, it is strictly dependent on the end-user being a member of the custom group with ID=CASHostAccountRequired, and the two principals (HTTP and sascas) being trusted for delegation. Without both the Kerberos delegation will not take place. The diagram below illustrates a slight deviation on the first use case. Here, either through choice or by omission, the end-user is not a member of the custom group with the ID=CASHostAccountRequired. Now even though the end-user connects with Kerberos and irrespective of the configuration of SAS Logon Manager to store delegated credentials the second connection using Kerberos is not made to SAS CAS. Now the SAS CAS session runs as the account that launched the SAS CAS controller, cas by default. Since, the session is not running as the end-user and SAS CAS did not receive a Kerberos connection, the Kerberos ticket cache that is generated for the session does not contain the credentials of the end-user. Instead, the Kerberos keytab and principal supplied to SAS CAS are used to establish the credentials in the Kerberos ticket cache. This means that even though Kerberos was used to connect to SAS Logon Manager the connection to the Secured Hadoop environment is as the sascas principal and not the end-user. The same situation could be arrived at if the HTTP principal for SAS Logon Manager is not trusted for delegation. A final deviation to the initial use case is shown in the following diagram. In this case the end-user connects to SAS Logon Manager with any other form of authentication. This could be the default LDAP authentication, external OAuth, or external SAML authentication. Just as in use case 1a, this means that the connection to SAS CAS from the visual interfaces only uses the internal OAuth token. Again, since no delegated credentials are used to connect to SAS CAS the session is run as the account that launched the SAS CAS controller. Also, the ticket cache created by the SAS Cloud Analytic Service Controller contains the credentials from the Kerberos keytab, i.e. the sascas principal. This means that access to the Secured Hadoop environment is as the sascas principal and not the end-user. Our second use case covers those users entering the environment via the programming interfaces, for example SAS Studio. In this case, the end-users have entered a username and password, a credential set, into SAS Studio. This credential set is used to start their individual SAS Workspace Session and to connect to SAS CAS from the SAS Workspace Server. This is illustrated in the following figure. Since the end-users are providing their username and password to SAS CAS it behaves differently. SAS CAS uses its own Pluggable Authentication Modules (PAM) configuration to validate the end-user’s credentials and hence launch the SAS CAS session process running as the end-user. However, in addition the SAS CAS Controller also uses the username and password to obtain an OAuth token from SAS Logon Manager and then can obtain any access control information from the SAS Viya 3.3 microservices. Obtaining the OAuth token from the SAS Logon Manager ensures any restrictions or global caslibs defined in the visual interfaces are observed in the programming interfaces. 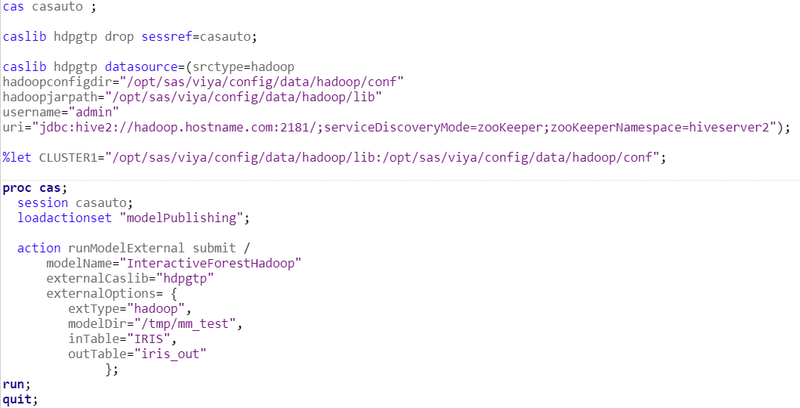 With the SAS CAS session running as the end-user and any access controls validated, the SAS CAS session can access the Secured Hadoop cluster. Now since the SAS CAS session was launched using the PAM configuration, the Kerberos credentials used to access Hadoop will be those of the end-user. This means the PAM configuration on the machines hosting SAS CAS must be linked to Kerberos. This PAM configuration then ensures the Kerberos Ticket-Granting Ticket is available to the CAS Session as is it launched. Next, we consider three further use cases where the client is SAS 9.4 maintenance 5. 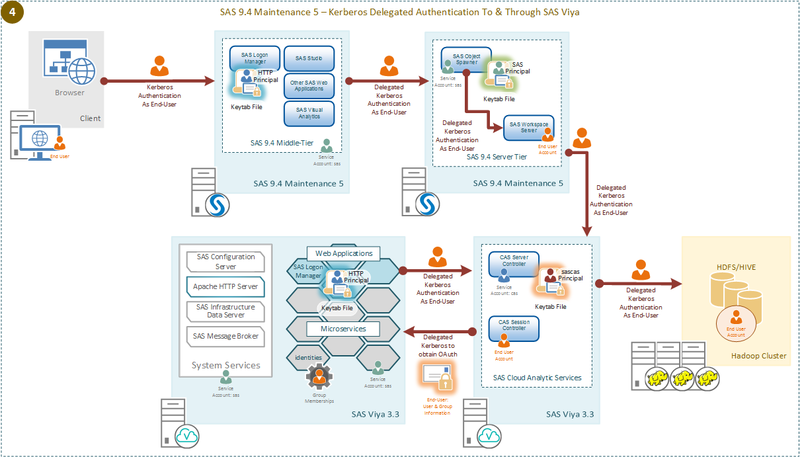 Remember that SAS 9.4 maintenance 5 can make a direct connection to SAS CAS without requiring SAS/CONNECT. The use cases we will discuss will illustrate the example with a SAS 9.4 maintenance 5 web application, such as SAS Studio. However, the statements and basic flows remain the same if the SAS 9.4 maintenance 5 client is a desktop application like SAS Enterprise Guide. 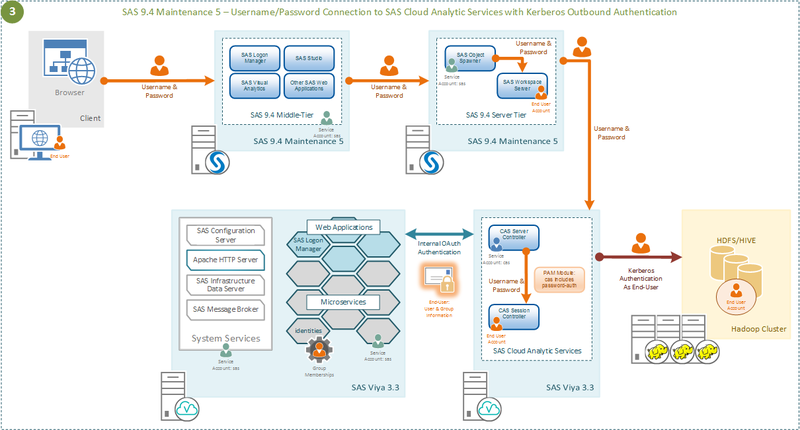 First, let’s consider the case where our SAS 9.4 maintenance 5 end-user enters their username and password to access the SAS 9.4 environment. This is illustrated in the following diagram. In this case, since the SAS 9.4 Workspace Server is launched using a username and password, these are cached on the launch of the process. This enables the SAS 9.4 Workspace Server to use these cached credentials when connecting to SAS CAS. However, the same process occurs if instead of the cached credentials being provided by the launching process, they are provided by another mechanism. These credentials could be provided from SAS 9.4 Metadata Server or from an authinfo file in the user’s home directory on the SAS 9.4 environment. In any case, the process on the SAS Cloud Analytic Server Controller is the same. The username and password used to connect are validated through the PAM stack on the SAS CAS Controller, as well as being used to generate an internal OAuth token from the SAS Viya 3.3 Logon Manager. The PAM stack, just as in the SAS Viya 3.3 programming interface use case 2 above, is responsible for initializing the Kerberos credentials for the end-user. These Kerberos credentials are placed into a Kerberos Ticket cache which makes them available to the SAS CAS session for the connection to the Secured Hadoop environment. Therefore, all the different sessions within SAS 9.4, SAS Viya 3.3, and the Secured Hadoop environment run as the end-user. Now what about the case where the SAS 9.4 maintenance 5 environment is configured for Kerberos authentication throughout. The case where we have Kerberos delegation configured in SAS 9.4 is shown here. Here the SAS 9.4 Workspace Server is launched with Kerberos credentials, the Service Principal for the SAS 9.4 Object Spawner will need to be trusted for delegation. This means that a Kerberos credential for the end-user is available to the SAS 9.4 Workspace Server. The SAS 9.4 Workspace Server can use this end-user Kerberos credential to request a Service Ticket for the connection to SAS CAS. SAS CAS is provided with a Kerberos keytab and principal it can use to validate this Service Ticket. Validating the Service Ticket authenticates the SAS 9.4 end-user to SAS CAS. The principal for SAS CAS must also be trusted for delegation. We need the SAS CAS session to have access to the Kerberos credentials of the SAS 9.4 end-user. These Kerberos credentials made available to the SAS CAS are used for two purposes. First, they are used to make a Kerberized connection to the SAS Viya Logon Manager, this is to obtain the SAS Viya internal OAuth token. Therefore, the SAS Viya Logon Manager must be configured to accept Kerberos connections. Second, the Kerberos credentials of the SAS 9.4 end-user are used to connect to the Secure Hadoop environment. In this case since all the various principals are trusted for delegation, our SAS 9.4 end-user can perform multiple authentication hops using Kerberos with each component. This means that through the use of Kerberos authentication the SAS 9.4 end-user is authenticated into SAS CAS and out to the Secure Hadoop environment. Finally, what about cases where the SAS 9.4 maintenance 5 session is not running as the end-user but as a launch credential; this is illustrated here. The SAS 9.4 session in this case could be a SAS Stored Process Server, Pooled Workspace Server, or a SAS Workspace server leveraging a launch credential such as sassrv. The key point being that now the SAS 9.4 session is not running as the end-user and has no access to the end-user credentials. In this case we can still connect to SAS CAS and from there out to the Secured Hadoop environment. However, this requires some additional configuration. This setup will leverage One-Time-Passwords generated by the SAS 9.4 Metadata Server, so the SAS 9.4 Metadata Server must be made aware of the SAS CAS. This is done by adding a SAS 9.4 metadata definition for the SAS CAS. 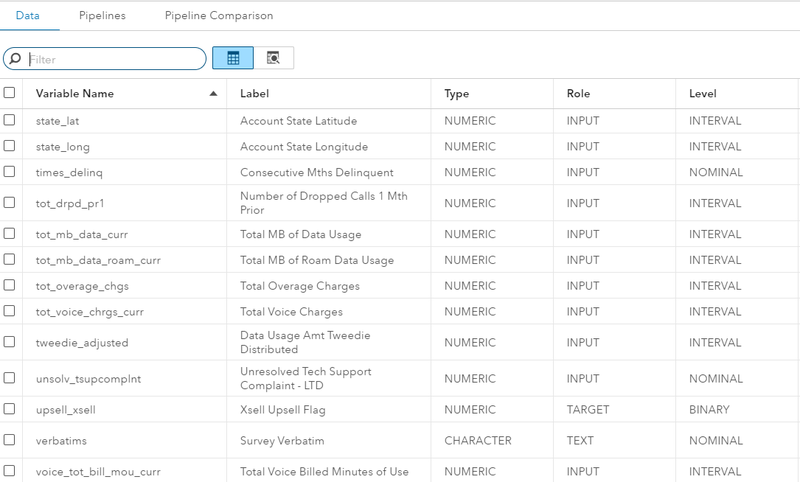 Our connection from SAS 9.4 must then be “metadata aware,” achieved by using authdomain=_sasmeta_ on the connection. Equally, the SAS Viya 3.3 side of the environment must be able to validate the One-Time-Password used to connect to SAS CAS. 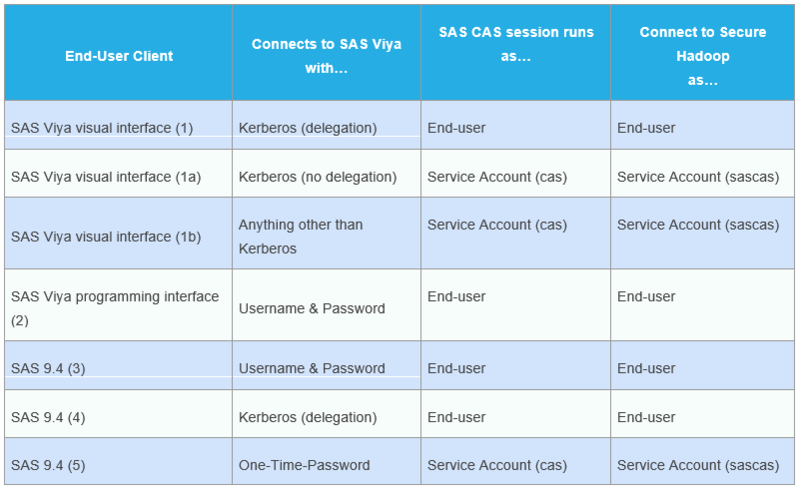 When SAS CAS receives the One-Time-Password on the connection, it is sent to the SAS Viya Logon Manager for validation and to obtain a SAS Viya internal OAuth token. We need to add some configuration to the SAS Viya Logon Manager to enable this to validate the One-Time-Password. 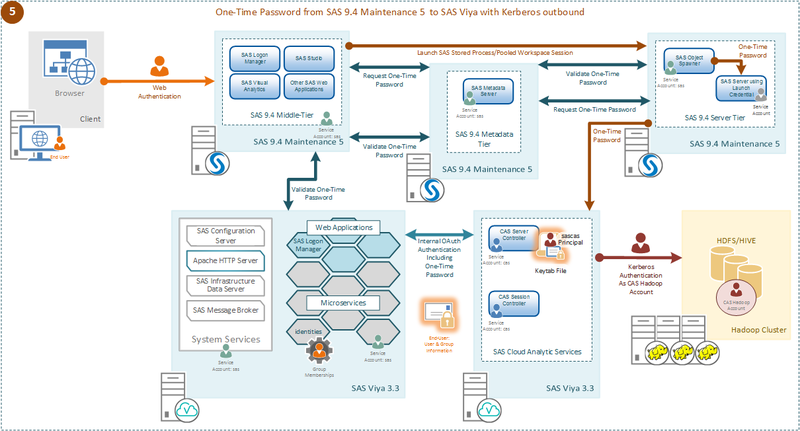 We configured the SAS Viya Logon Manager with the details of where the SAS 9.4 Web Infrastructure Platform is running. The SAS Viya Logon Manager passes the One-Time-Password to the SAS 9.4 Web Infrastructure Platform to validate the One-Time-Password. After the One-Time-Password is validated a SAS Viya internal OAuth token is generated and passed back to SAS CAS. Since SAS CAS does not have access to the end-user credentials, the session that is created will be run using the account used to launch the controller process, cas by default. Since the end-user credentials are not available, the Kerberos credentials that are initialized for the session are from the Kerberos keytab provided to SAS CAS. Then the connection to the Secured Hadoop environment will be made using those Kerberos credentials of the principal assigned to the SAS CAS. We have presented several use cases above. The table below can be used to summarize and differentiate the use cases based on key factors. SAS Viya 3.3 - Some Kerberos principles was published on SAS Users. Todd Wright says Hadoop can be difficult – but data management can help. The post Data management makes Hadoop easier appeared first on The Data Roundtable. Does Hadoop equal big data? What else does big data mean? Joyce Norris-Montanari explains why it's so important to pick the right tools to manage your big data. The post Does Hadoop equal big data? What else does big data mean? appeared first on The Data Roundtable. David Loshin discusses big data identity resolution in a programming and execution environment. The post Understanding big data identity resolution appeared first on The Data Roundtable. In part 2, Jim Harris explains more about why you should address data quality and governance issues on the way to data lakes and Hadoop. The post On the way to data lakes and Hadoop – Part 2 appeared first on The Data Roundtable.